Patient will present as → a 40-year-old carpet installer who spends his working day on his knees, fitting carpets. In the past few months, he had been aware of a dull ache over his right knee, which had seemed to be aggravated by pressure and on flexion of the knee. He had been wearing kneepads, using a soft mat and trying to avoid kneeling on that knee. However, he was alarmed to wake one morning with a large, tender, fluctuant swelling over the kneecap. Pain with direct pressure on the knee (kneeling). Common in wrestlers: concern for septic bursitis in wrestlers - aspiration with gram stain and culture. Treatment: compressive wrap, NSAIDs, +/- aspiration and immobilization for 1 week. Corticosteroid use is controversial. 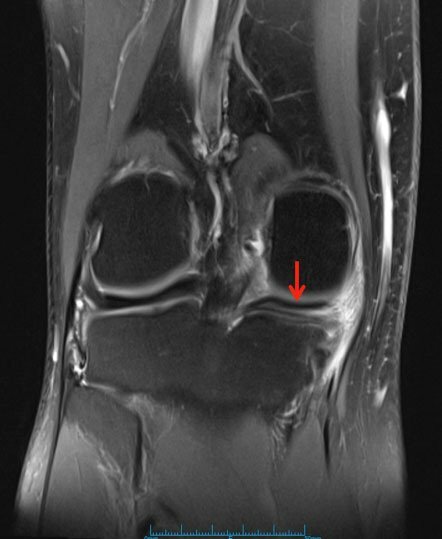 Patient will present as → a 22-year-old college basketball player with chronic anterior pain of her right knee. The patient has had over 6 months of physical therapy without improvement. It initially only bothered her during training, but she is now no longer able to compete and has pain with daily activities. Physical exam reveals swelling of the anterior knee and tenderness to palpation at the distal pole of the patella in full extension and no tenderness to palpation at distal pole of the patella in full flexion. Her MRI is shown here. 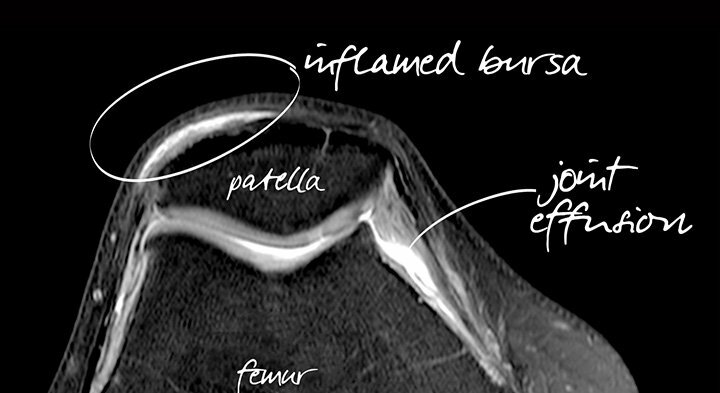 Activity-related anterior knee pain associated with focal patellar tendon tenderness. Also known as "jumper's knee" (up to 20% of jumping athletes). 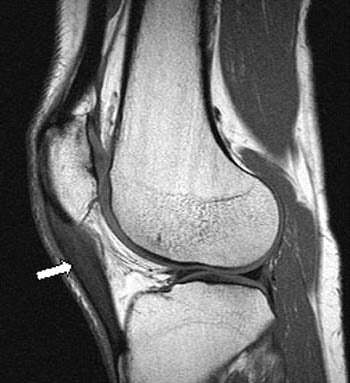 May present with swelling over tendon and tenderness at the inferior border of the patella. Basset's sign: tenderness to palpation at distal pole of the patella in full extension and no tenderness to palpation at distal pole of the patella in full flexion. 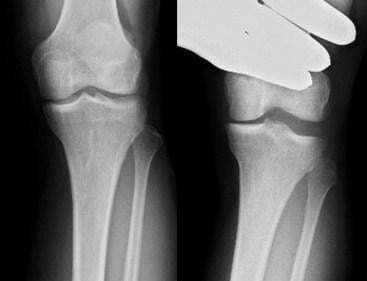 Radiographs - AP, lateral, skyline views of the knee - usually normal -may show inferior traction spur (enthesophyte) in chronic cases. 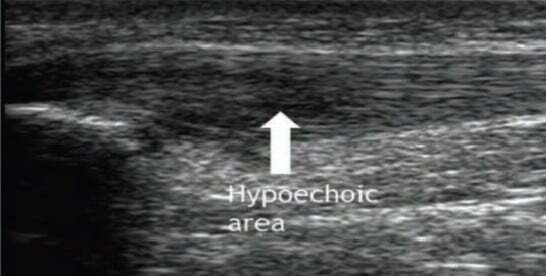 Ultrasound - thickening of tendon and hypoechoic areas. 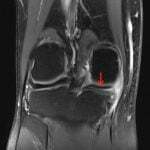 MRI in chronic cases - demonstrates tendon thickening. Ice, rest, activity modification, followed by physical therapy. 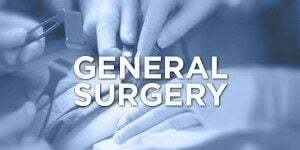 Surgical excision and suture repair as needed. 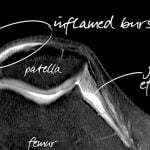 Cortisone injections are contraindicated due to risk of patellar tendon rupture. Patient will present as → a 24-year-old male with severe pain in the right knee. He is a professional football player and a few hours prior to presentation, an opposing player hit his leg from his left side. Afterward, he felt a “popping” sound that was followed by severe knee pain and a sensation of knee instability. On physical exam, there is an anterior translation of the proximal tibia when pulled as the patient has the knee flexed at 90° and supine. Ice is applied to the knee and ibuprofen is prescribed. An MRI is ordered. 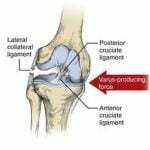 Orthopedic surgery is consulted to evaluate if ligament reconstruction is needed. Pop and swelling along with instability or "giving out" the knee after a quick plant and twist injury. Quickly stopping movement and changing direction while running, landing from a jump, or turning leads to rotation or valgus stress of the knee and can result in injury to the ACL. Common in skiers, football, and basketball players. 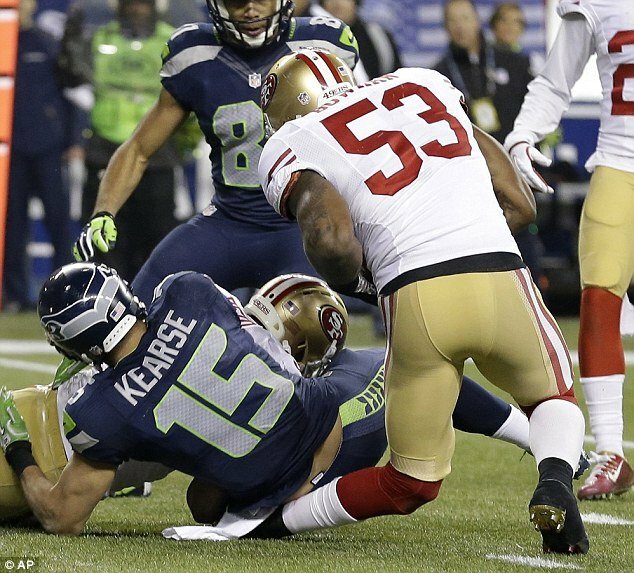 Contact injury that causes hyperextension or valgus deformation of the knee. Anterior Drawer Test: the proximal tibia is anteriorly pulled while the patient is supine and the knee is flexed at 90 degrees - if there is anterior translation then the test is positive. Lachman's Test (most sensitive): the proximal tibia is anteriorly pulled with one hand, while the other hand stabilizes the distal femur while the knee is flexed at 30 degrees. Magnetic resonance imaging (MRI) can confirm the diagnosis. Physical therapy and lifestyle modifications for low demand patients with decreased laxity. Surgical reconstruction performed in young and active patients with high demand sports or jobs and/or significant knee instability. 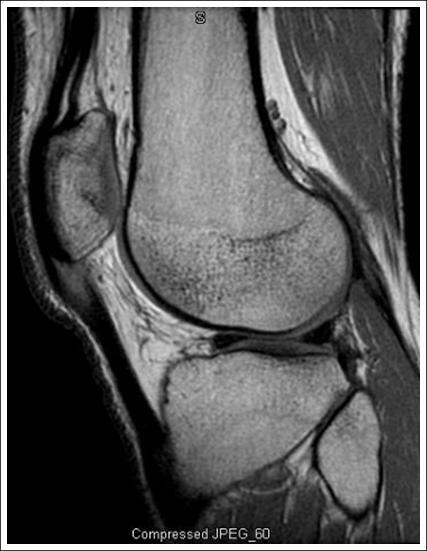 A 33-year-old male presents to your office with a complaint of right knee injury associated with pain and swelling. He states he was running after his loose dog and suddenly stopped, hyperextended his knee, heard a pop and noticed immediate swelling. On physical examination, the Lachman test and anterior drawer test demonstrates joint laxity. Which of the following ligaments is most likely injured? 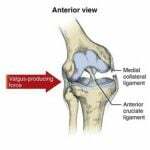 Medial collateral ligament injuries often occur with rotational injuries or direct impact to the lateral knee. Tenderness medially with laxity with valgus (medial) stress is noted. 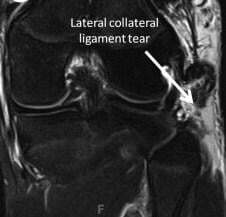 Lateral collateral ligament injury causes pain mostly on the lateral aspect of the knee and patients can experience knee buckling with normal gait. Tenderness laterally with laxity with varus (lateral) stress is noted. 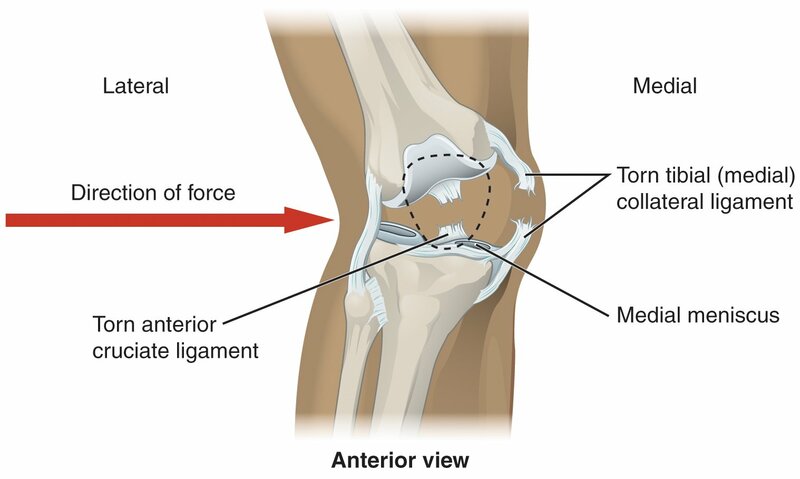 Posterior cruciate ligament injuries occur with an outside directed force, often a posterior directed force such as a knee striking a dashboard. The patients often do not hear a pop. A posterior drawer test or posterior sag test can be useful in the diagnosis. 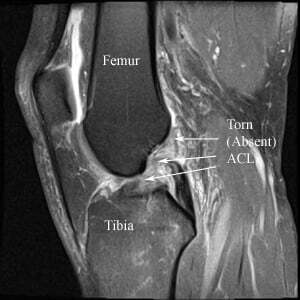 Anterior cruciate ligament injuries occur with sudden deceleration injuries. 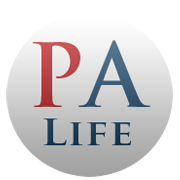 Patients often hear a pop and the diagnosis is aided by assessing the anterior drawer test and Lachman test. The immediate swelling as well as laxity with anterior drawer test and Lachman test should raise suspicion of anterior cruciate ligament injury. 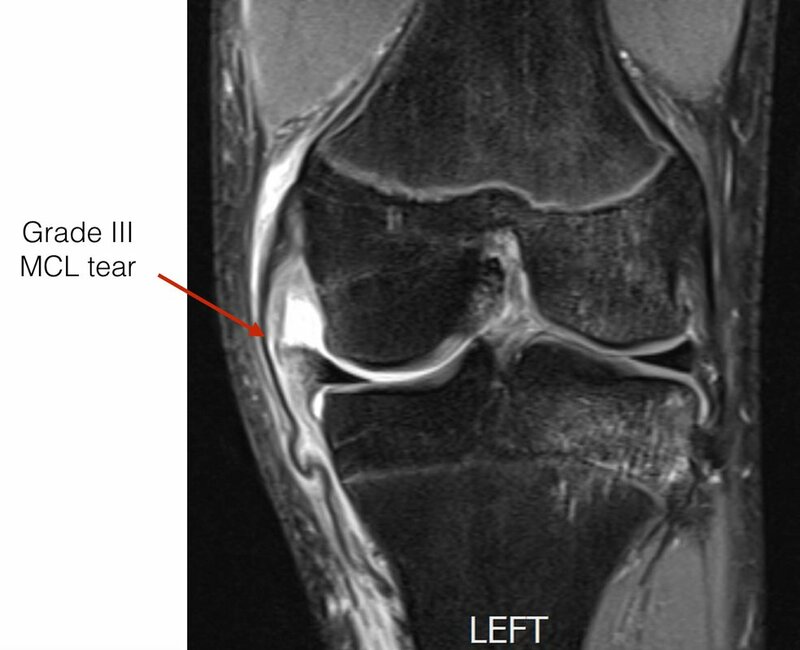 Patient will present as → a 26-year-old college football player is brought to the emergency department after being hit on the lateral side of the left knee. He reports hearing a pop and then his knee buckled. He is now in severe pain and if having difficulty walking. On examination, there is swelling over the medial aspect of the left knee. There is laxity when a valgus stress test is performed on the knee. The results of the Lachman and McMurray tests are negative. 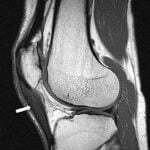 You order an MRI of the knee with results seen here. 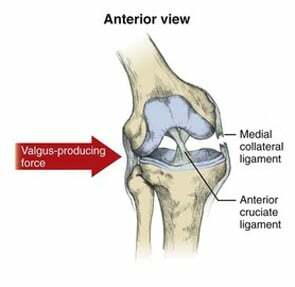 Patient will present → after sustaining a valgus stress injury (from the outside) such as a hit in football. Results when the knee is forced into valgus and external rotation force to the lateral knee. A "pop" reported at the time of injury along with medial joint line pain and difficulty ambulating due to pain or instability. Testing: Valgus stress test - Patient will have pain with valgus stress applied to the knee. Patient will present as → a 25-year-old soccer player injures his knee after colliding with an opposing player during a game. 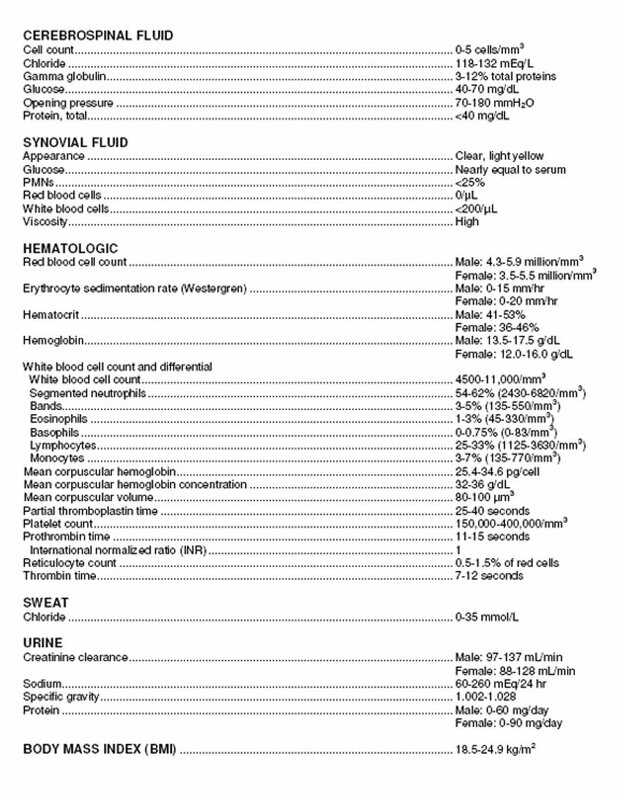 On physical exam, his Lachman is weakly positive. He has laxity to varus stress with the knee flexed to 30 degrees. Dial test of the tibia shows increased external rotation at 30 degrees, but not at 90 degrees in comparison to the contralateral leg. 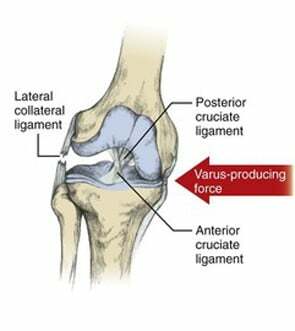 The main cause of LCL injuries is direct-force trauma to the inside of the knee causing excessive varus stress, external tibial rotation, and/or hyperextension. 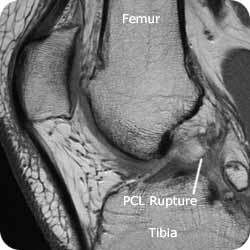 Isolated injury extremely rare - 7-16% of all knee ligament injuries when combined with lateral ligamentous complex injuries, particularly posterolateral corner (PLC) injury. MRI definitive study - provides information about severity (complete vs. partial rupture) and location (avulsion vs. midsubstance tear). Conservative treatment with bracing and therapy typically effective. Surgery for grade III LCL injury. 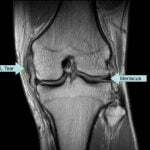 Patient will present as → a 22-year-old recreational soccer player who sustained a right knee injury 6 months ago. He has been treated with rest and rehabilitation but is unable to play at his previous level due to his knee “giving way.” Physical exam reveals 10° varus alignment when standing and a varus thrust with walking. Strength is full compared to the other side. Ligamentous exam reveals a stable ACL and MCL but opens to a varus stress and a 3+ posterior drawer and positive dial test at both 30° and 90° degrees of flexion. 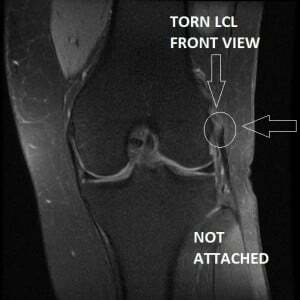 PCL injuries can also result from a blow to the knee while it is flexed, or bent, such as landing hard during sports or a fall, or from a car accident (also known as dashboard knee). May result from non-contact hyperflexion with a plantar-flexed foot or a hyperextension injury. 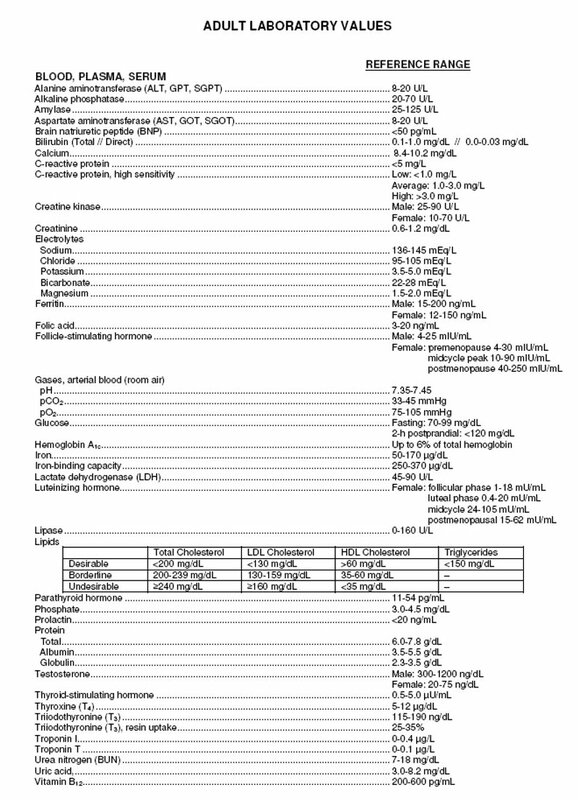 Protected weight bearing and rehab indicated for isolated Grade I (partial) and II (complete isolated) injuries. Surgical repair for PCL + ACL or PCL injuries and PCL + Grade III MCL or LCL injuries. 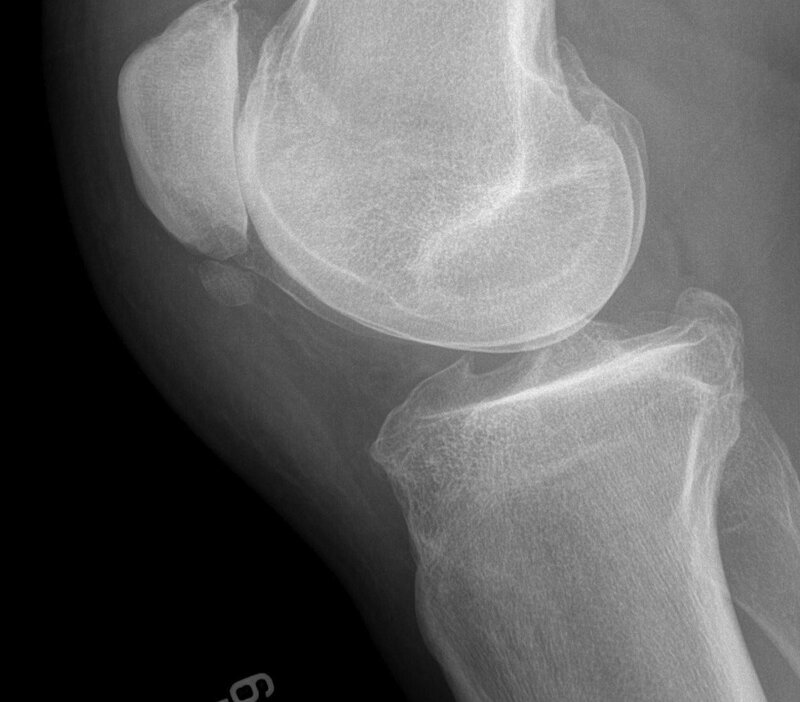 Patient will present as → a 35-year-old man with complaints of swelling and pain in left knee. The patient states that he sustained a twisting injury in a football game 3 days ago. The injury did not take him out of the game; he was able to continue participating with minimal difficulty. Over the last 2 days, the pain has progressed. He notes a catching sensation and pain that is more medially located. On physical examination, the patient is found to have tenderness over the medial joint line and limited range of motion. 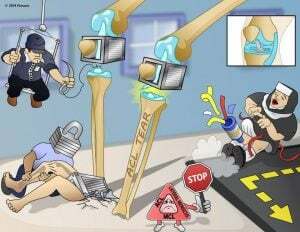 Forced flexion and circumduction of the joint cause a painful click. After a "twist" injury with locking, a feeling of the knee giving away, walking up and down stairs or squatting is difficult and painful. 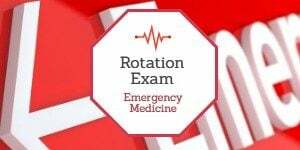 McMurray test (watch video): patient is supine, knee flexed and externally (medial meniscus) or internally (lateral meniscus) then extended - pain indicates a tear. Apley test (watch video) will be positive: Pt prone, knee to 90 degrees, axial load with rotation causes pain with meniscal pathology. The ACL stabilizes the knee by resisting hyperextension and anterior dislocation of the tibia during flexion. Injuries typically occur during non-contact sports such as basketball and soccer, but can also occur from trauma. 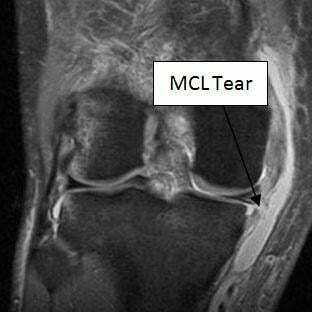 This injury is a tear of the ligament that connects the femur to the tibia on the medial aspect of the knee. It occurs in patients that have experienced high-energy trauma. It is typically treated conservatively and can be clinically observed with the valgus stress test. The menisci are fibrocartilage semicircular bands that serve to stabilize the knee and absorb forces between the distal femoral condyles and the proximal tibial plateau of the knee. Injury can be sustained from trauma or in a degenerative manner. Symptoms include locking and clicking, as well as a positive McMurray test. 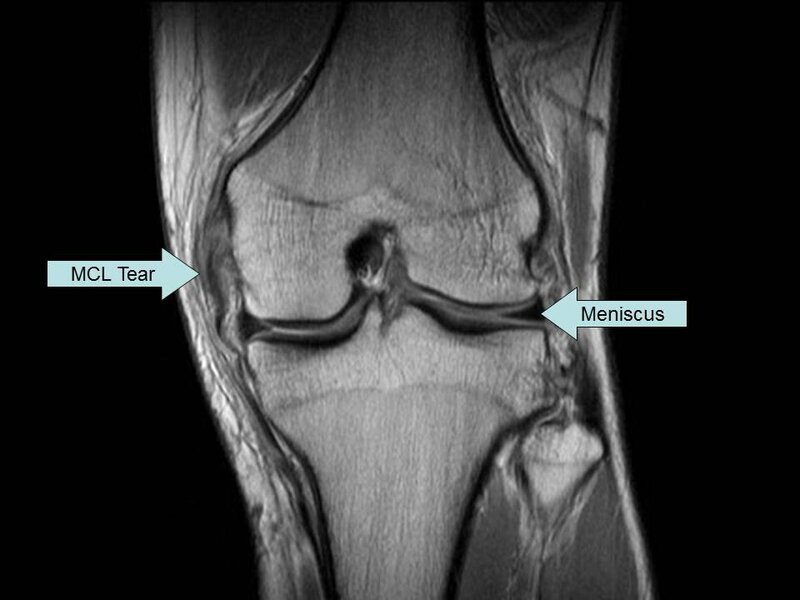 Meniscus tears are typically managed conservatively, or in serious cases, surgery.